I have a 2005 X5 4.4i. While driving on a badly serviced street, I put the height setting on the raised (up). I was stopped at a red light when I did this. The car raised up (I could tell because I noticeably rose compared to the cars in front and beside me. The car height stayed raised for about a minute while I drove and then I noticed that the up and middle lights were blinking and then a few seconds later, I was back to center again. This happens on the low setting as well. They don’t stay for more than a minute maybe less. Has anyone seen this before? 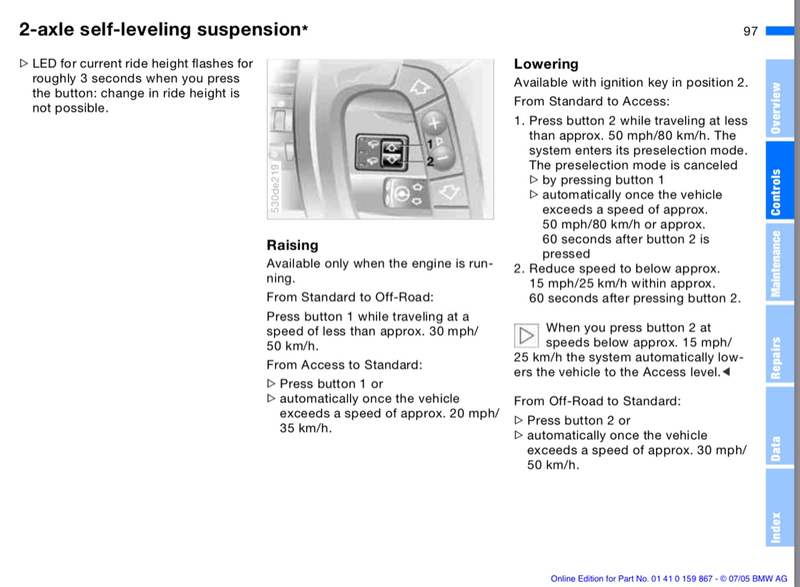 If your speed was over 30mph it automatically goes back to standard height. How fast were you going after raising the car? That is most likely what was happening. I’ll try it again and verify. I totally missed the speed triggers when looking through the pdf manual I got online. Thanks again!